I've said it before - all it really takes for a great customer experience is for someone to care and to apply the human touch. 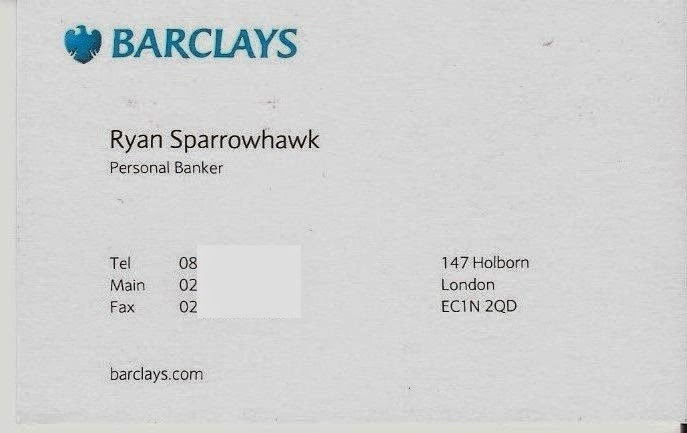 I never thought I'd be saying such a thing about my bank Barclays - having had a number of horrible experiences with them over the years, one of the things on my list of things to do while I am taking a bit of a career break is to change banks. Yesterday afternoon I was on my way into the City for a meeting with a recruitment consultant when a text arrived from Barclays saying that a new debit card had been ordered for me and that my existing one would work until it arrived. Which is a little problematic when you're about to go travelling around North America and need the current one to work. The text had a number on it to call if this was an issue, which naturally it was given that my existing card had a year left until it expired and given my pending trip. I called the number from my mobile (so hence it has cost me, even though it was an 0800 number) and was put through to their fraud department after 40 minutes on hold. It's fair to say they were worse than useless. (2) "In March, you ate in a restaurant one day - which one and how much did you spend?" Probably the most ridiculous question that could be asked and I would challenge anyone to be able to answer it! Naturally I said I couldn't answer that (if he'd at least narrowed it down to a date, I could have checked via online banking!) and asked if they could just un-order the card that had been ordered, so that I could use my existing one while I was away. Frustratingly they said I had to take two forms of identification into a branch to be able to have this done, which I said I would do today and ended the call. Your Barclays Debit Card has been temporarily deactivated to prevent fraudulent activity. Please call us immediately on 0800 085 1721 for assistance. So here I was, 45 minutes before I was due to meet the recruitment consultant with no cash on me, no ability to clear the unclearable security questions to get my card reactivated and stuck in London - being due to meet a friend for dinner last night. In desperation I found a Barclays branch in Moorgate and wandered in to be greeted by Ryan in the personal banking team - who couldn't have been more helpful. His manner was great and helpful throughout and he even ran up 4 flights of stairs to ensure I made the meeting with the consultant on time, apologising for how I had been treated and being very sympathetic. The best result was that I got to my meeting on time and had an excellent Chinese in the West End with a couple of friends afterwards, having been able to use my new Debit Card to pay for it. Am I still going to change banks? Any more interactions with Barclays' useless fraud team and I'd have to consider it, but someone as brilliant as Ryan taking the time to sympathise and go out of his way to resolve the issue (the most important factor in any great customer experience) has certainly resulted in me putting it off for the time being. All it takes is one person to care and focus on the customer. Britain needs more Ryans! PS Hopefully Barclays sees this blog and treats him to a well deserved meal of his own for being so customer focused. I'm off to tweet them now!